Mark Asanovich, MA, CSCS, HFI, is one of the American professional football world’s most experienced strength and conditioning coaches employing high-intensity training, spending years with the Minnesota Vikings, the Tampa Bay Buccaneers, the Baltimore Ravens, and the Jacksonville Jaguars, where he has trained numerous NFL athletes, Pro-Bowlers, and Hall-of-Famers such as Derrick Brooks, Cris Carter, Randall McDaniel, John Randle, and Warren Sapp, – just a small selection of the many, many high-level athletes Mark has trained! Mark has also coached and trained at the high school and collegiate levels, and he has spoken all over the world in numerous events such as the Resistance Exercise Conference and American Football Coaches Association National Convention, and he is also a contributing author to the books Death in the Locker Room II: Drugs and Sports ( Amazon US / Amazon UK ) and The New High Intensity Strength Training ( Amazon US / Amazon UK ). 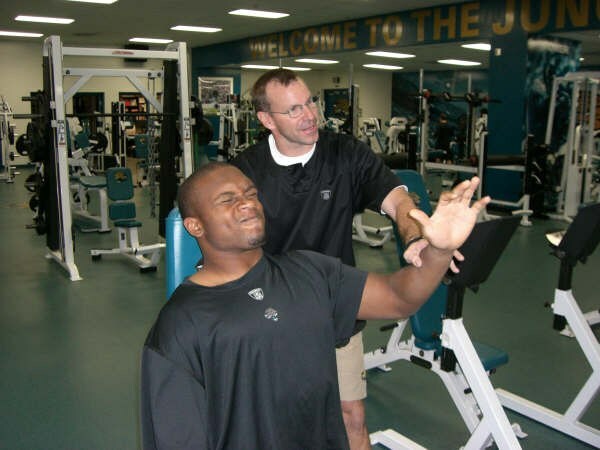 Today, Mark remains an active researcher, speaker, and co-author in evidence-based strategies for proactively mitigating the severity and frequency of cervical spine injury and traumatic brain injury through head and neck strengthening. As well as being utilised by many HIT trainers to deliver highly effective and efficient workouts to their clients, ARX comes highly recommended by world-class trainers and brands including Bulletproof, Tony Robbins, and Ben Greenfield Fitness. To find out more about ARX and get $1,000 OFF software licensing fees, please go to ARXfit.com and mention Corporate Warrior in the how did you hear about us field. This episode is brought to you by the Resistance Exercise Conference – The science and application of strength training for health and human performance. Join a welcome reception on Friday night to build relationships with other strength training professionals? Experience an early morning workout from an expert trainer to kick start your Saturday? And get inspired, rejuvenated and focused on your strength training business? I certainly do and that is why I am attending and interviewing all of the speakers at the event. The resistance exercise conference will be held on the 9th and 10th of March 2018 in Minneapolis, Minnesota at The Commons Hotel. To get 10% off your entry fee, head on over to ResistanceExerciseConference.com, click the registration button and enter corporatewarrior10 in the promo code field in PayPal. QUESTION(S) OF THE DAY: Have you ever trained specifically for a sport? What was your experience like? Please let me know in the comments at the bottom of this post. Note to self, no more axial rotation….. I listened to Mr. Asanovich’s remarks on neck training intently. I like his neck training machine. I like his emphasis on neck training. He deserves high praise. I was extremely disappointed with his remarks on the necessity of full range of movement being necessary for optimal results. He referenced Arthur Jones’ work on S & G responders. Arthur Jones’ work on S & G responders is unproven. Professionals should not promote the unproven. Comments like his look bad for HITers everywhere. I have personally used heavy resistance bands for neck flexion and extension in an isometric-only manner for just one anatomical neck position. I wear size 22 inch neck shirts. My results are not a study-experiment-proof for anyone else. Of course…..Dr. McGuff (interviewed here) does not promote resistance band use either. No wonder HIT is unpopular in most exercise communities. Please ask Ken Hutchins about isometrics! Thank you Marc appreciate the contribution. I did wonder on this point and it’s something I need to research more. Hello Mr. Asanovich! I enjoyed your interview very much! Don’t have what else to say, than Thank you for sharing your wonderful experience with us!